Love That Max : Yesterday, he did something naughty. Wheeeeeeeeeeee! Yesterday, he did something naughty. Wheeeeeeeeeeee! Until Sabrina came around, I never had to childproof the house because Max wasn't a kid who poked around in drawers or opened cabinets. He also wasn't a child who pulled stuff off my nightstand and broke it or attempted to pop random stuff into his mouth such as Chapstick and dustballs (hello, Ben). Max couldn't explore or get into trouble because he lacked the fine-motor skills. But boy, they've come a long way. Yesterday, he and Sabrina had off from school thanks to a snowstorm. Max is going to Disney World next week on a boys' trip with Dave and his dad (he mentions it approximately eleventy billion times a day), and decided he needed to program that into my calendar after I left my phone lying on the kitchen counter. I did not realize this until I got a "Declined" notice from a staffer at a website I've done work for. 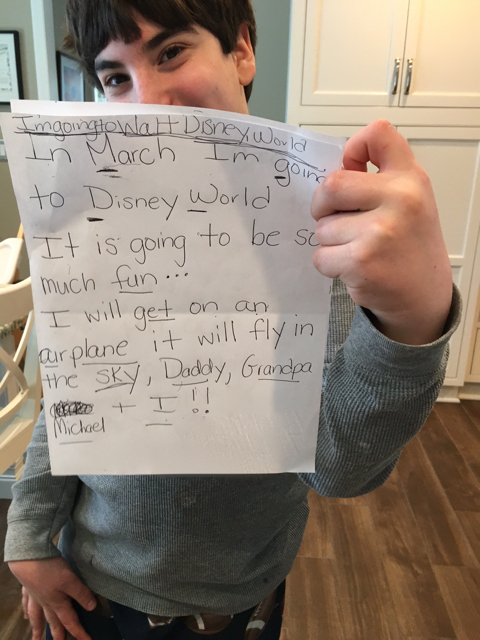 She had prudently decided not to attend any of the "I'm going to Disney World on March 23 2017" events Max had set up—two at 6 a.m. (one with the location) and the others at 4:00 and 6:00 pm. Max had actually invited all nine team members. I felt this weird mix of mortification and appreciation for his calendar skills (although he clearly needs pointers in the invitee department). I also felt a twinge of glee about his naughtiness. Part of me is still making up for the stuff I missed out on during his childhood, even the "bad" stuff. I've relished the times when Max acts up, even when he colored all over our wood floor in magic marker. I emailed and apologized to the website staff. A bunch of them are moms and they all have a sense of humor, so thankfully they got it. 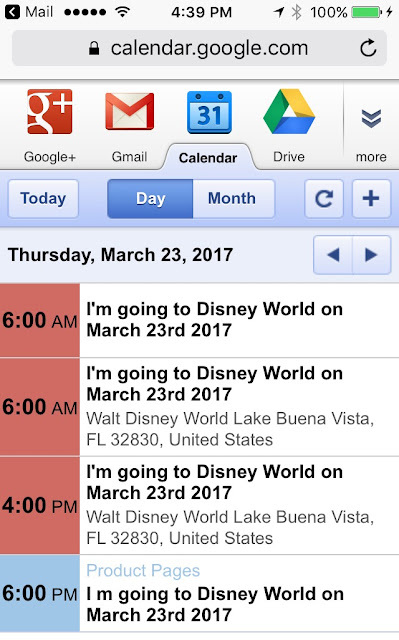 "Max, did you put Disney World into my calendar?" I asked. "Yesssssssssss!" he said, a big grin on his face. "Are you sure you want to go to Disney World?" This really makes me happy. Way to much SPED is about compliance. A kid has to be a kid and do what the others are doing! I think this is why school doesn't let my son go between classes by himself -- he doesn't go how they want him to go and sometime (gasp!) takes a detour. The way they handle it is to have a para with him to make sure he goes the way he is supposed to go. Here's to learning independence! I had trouble reading this because I lost it when the person declined the request. For some reason random erroneous calendar invites are a trigger for uncontrolled laughter for me. Really needed that. Thanks! This was such a fun post! My daughter is constantly stealing my phone lately to take pictures of her thighs and there some of my favorite things to look at on my phone when I get in bed at night!